It is with much reluctance that I begin "work" on my toys reviews. Frodo and I have been playing so hard and enjoying our new toys that the thought of sitting in front the computer to write the reviews is well, let's put it this way... we'd rather be playing than writing. The dog who has everything? Okay Little Mermaid.... unlike the Mer-dogs, you do not have to write reviews of your 'gadgets and gizmos aplenty'. So you win. And Frodo has mastered the art of being derp that he does not have do any work. So he wins too. Anywoof, Frodo and I have been arguing about which toy we I should review first. I have been very fickle about it. Every time I think, "Ok! We I am going to write about this toy! ", we go play with the toys again = more photos/videos and I will be "Oh crap! Maybe we I should write about that toy first." 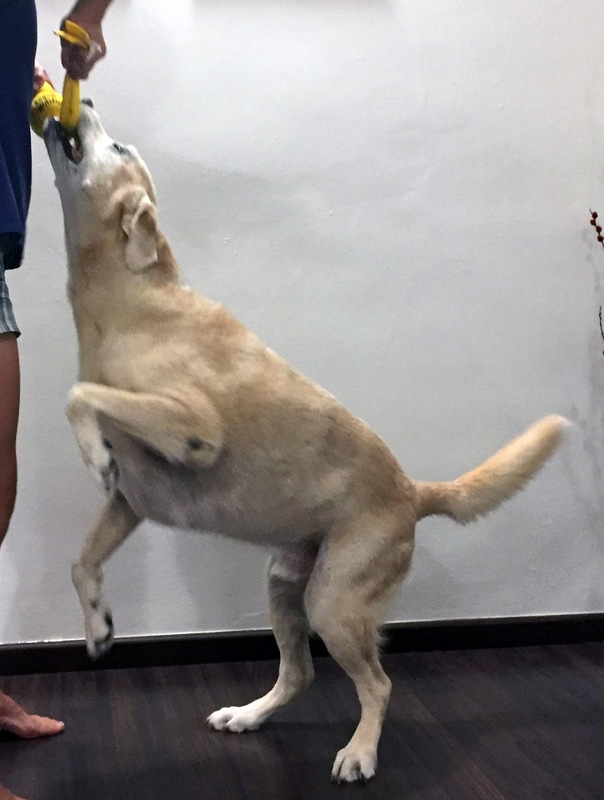 After much paws over it, I finally decided to start with the easiest toy to review - the KONG Wubba Dog Toy. Wubba! Wubba! It's Frodo Choo's Birthday! There's Mr Wubba Wet and Mr Wubba Classic getting tossed by mummy. What's Frodo's birthday without swimming... and without Mr Wubba? 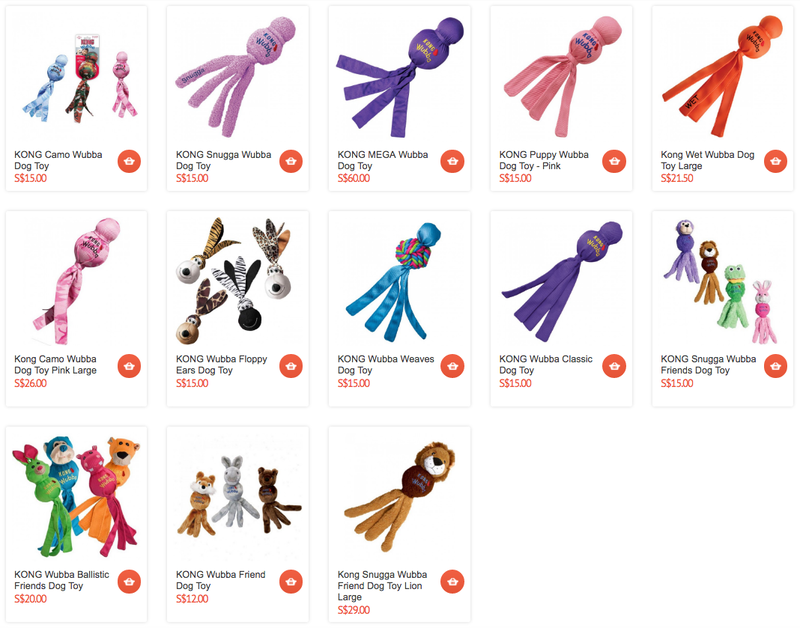 In my review of Kohepets online store, I briefly mentioned about Goondu Frodo leaving our Wubba toy out at sea so we were Wubba-less for quite a few months. We received THAT Wubba present two years ago during Frodo's 4th birthday bash. Or was it my 4th birthday present from 6 years ago? My memory is failing me. But anywoof, it is gone. Waddle waddle. Maybe the otters who slapped my intellectually-challenged brother are playing with it. Did get slapped by otters. I have missed Mr Wubba oh-so-much during our swims. So when Kohepets gave me that mini shopping budget, I sneakily ordered not one, but TWO Mr Wubba - Mr Wubba Classic and Mr Wubba Wet. HOWEVER, mummy hijacked Mr Wubbas and decided to keep it till Frodo's birthday. Okay okay, I have been Elastoplast-ed on my ears which resulted in mummy's decision to momentarily cease our swim activity. But since it was Frodo's birthday, mummy decided, "What the heck! What's Frodo's birthday without swimming?". Off to the sea we went. "Ok bro! Let's see who can get to Mr Wubba!" 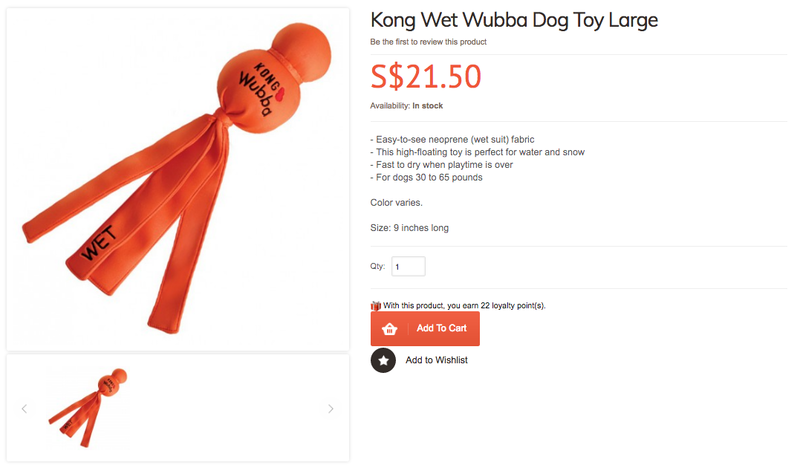 You might be wondering... what's so special about KONG Wubba that has made it into our 'MUST-HAVE' swim toy? Second, Mr Wubba only makes its grand entrance during part 2 of our swim sessions. Mummy burns off Frodo and my intial burst of energy with our stinky, filthy, overused and overslobbered tennis balls. And then I start to pretend disinterest in the tennis balls by persistently rolling in the sand and tada! Mr Wubba emerges and hello sea! Flapper Choo is back in action. Thirdly, Mr Wubba can be tossed pretty far out at sea and as you can see from the images above, the 'fluttering tails' not only allows the human to have a good grip while tossing it, it is visually appealing for Frodo and me to want to chase after it to retrieve. Fourthly, it can double and triple up as a toss-and-catch and tug-of-war toy. Lastly, we love toys that squeak. 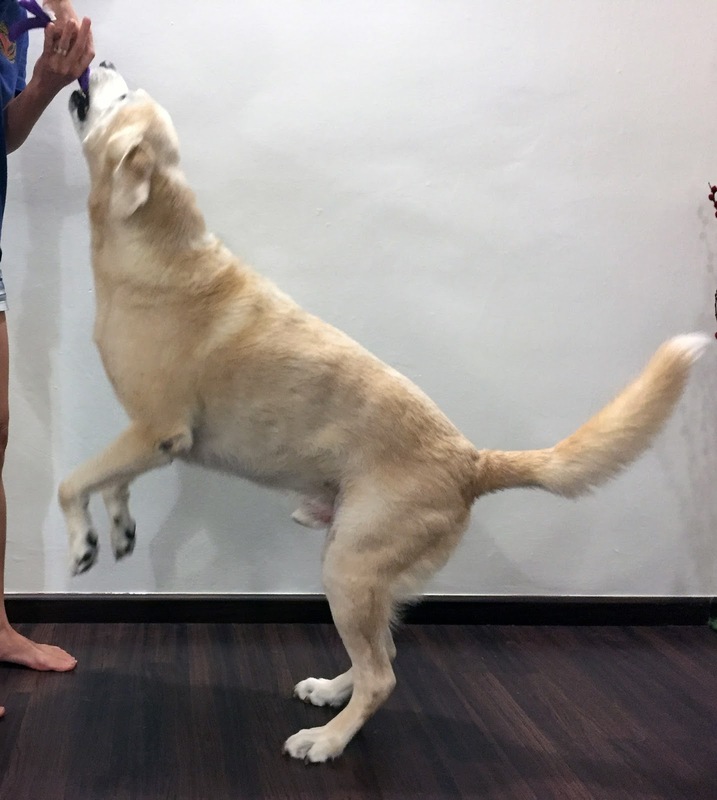 Akin to establishing food value in reward-based training, it is equally important to maintain toy value with us dogs. Throw it around the house every day and the toy loses it value. All our toys are kept away and only taken out when mummy says it's play time. So imagine the value of Mr Wubba! Frodo and I go gaga over it when we are out swimming = more swim time! On this note, I must point out that the value of toys is determined by us dogs. Sorry humans! You may have heard this before but when it comes to food and toy value, the saying is true. CONSULT THE DOG. Do I have a toy that comes in higher value than Mr Wubba? Yes I do! But I think I may have semi-killed it or lost it or.... I cannot remember. But Mr Wubba is overall pretty durable and serves its purpose well so after many years of tossing different toys out at sea, it became our must-have toy for swimming. I could hear mummy cursing and swearing as she was trying to select our new Mr Wubba. It was not just about selecting Mr Wubba but the correct size too. That's the thing about online shopping which is we do not get a reality of the actual/dimension. Buying online is a bit like lottery... and loads of luck of the correct guess. 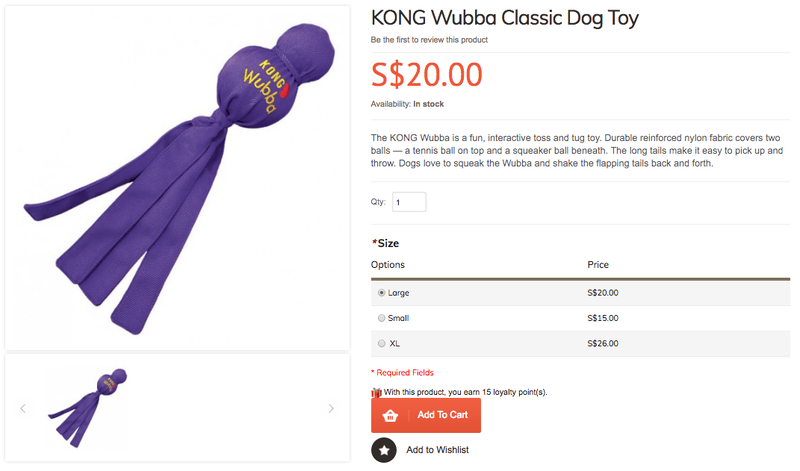 And as I am typing this review right now, I can hear mummy weeping in the background, "Why didn't I see the adorable 'Floppy Ear Dog' Wubba?" I was down to Mr Wubba Classic/Camo or Mr Wubba Wet. Classic vs Camo = Plain vs Camo-Printed Nylon Material. So while mummy's back was turn, I clicked one Classic and one Wet. LARGE, please. Close page. Don't let mummy see. Mr Wubba Classic (left) and Mr Wubba Wet (right) straight out from the box! The main reason for getting Mr Wubba WET was to see if there was any significant difference between the Nylon vs Neoprene (aka diving wet suit) Wubba. And since the neoprene material is 'advertised' for wet use (for obvious reasons), I wanted to see what's the big difference between both (if any) since Mr Wubba CLASSIC does float in water too. And well, so at least I have something to review rather than "I love Mr Wubba". Ha! Mr Classic is slightly heavier than Mr WET. Mr Classic weighs in at around 200g while Mr WET weighs in at 150g. The nylon material feels a little heavier in comparison to the neoprene material though the latter feels "beefier". Despite the weight difference, both toys flies out about the distance with the same amount of strength used though from my recollection, Mr Wubba Classic covered further distance. Classic 1, Wet 1. The beauty of watching both Mr Wubba air-borne at the same time! The nylon material with its heavier weight gives the user a better feel when tossing. Perhaps it is user-problem but the neoprene one 'misfired' quite a few times when the user tossed it. Classic 1, Wet 0. Mr Wubba WET 'misfired' and flew out to the wrong direction. 'Toss-ability' - The nylon (classic) one feels a little scarier when doing 'toss-and-catch' especially with the added weight of water. It can also make it a tad bit trickier/harder for the dog to secure it in the mouth. The user was a tad bit worried it may end up hitting Frodo's head.... Classic 0, Wet 1. Mr Wubba WET, with its lighter weight, makes it a nicer and safer 'toss-and-catch' toy especially for the legendarily bad catcher named Frodo Choo. It was a miracle that day. Frodo caught Mr Wubba WET twice consecutively. He gave mummy false hope. Surprise! Surprise! Frodo caught Mr Wubba Classic too without causing concussion to himself! Mr Wubba Classic SQUEAKS. Mr Wubba WET does not. On this count, Mr Wubba Classic wins. Squeaks are important. Classic 1, Wet 0. 'Dry-ability' - As of today, 9 days post our swim, Mr Wubba Classic still has water in the hidden ball while Mr Wubba WET does not. Classic 0, Wet 1. 'Stain-ability' - See image below. Classic 1, Wet 0. After one use, Mr Wubba WET (left) has unremovable stains whereas Mr Wubba Classic (right) still looks brand new... with unevaporated water inside. Ha! Mr Wubba Classic has been tested and proven to be very hardy and durable... even when used on a monster mouth like me! Attempting to play tug-of-war on Mr Wubba Wet and I thought I heard some crackling sound. Nothing torn... yet but I'm not risking it. Affordability - Last but not least... it is time to compare both prices. Based on Kohepets prices, Mr Wubba Classic (Large) sits at SGD20.00 per piece while Mr Wubba WET (Large) sits at SGD21.50 per piece. 'Classic' is available in 3 sizes - S, L, XL while 'WET' is only available in 1 size - L. For about $20 per piece of toy that is DURABLE, floats, tosses and tugs, it is certainly something my stingy mummy would invest in just because it serves our (Frodo and me) purpose very very well = good usability mileage. It is no brainy toy but a good brainless toy to match our active lifestyle. Wubba! Wubba! Which Wubba is the fairest of 'em all? Dilemma dilemma! Which is the fairest Wubba of 'em all? At this point, Classic vs WET count sits at 5:2. But as mummy always says, consult the dogs. Because it squeaks, slightly cheaper and proven durability, it gets 4 out of 5 Flaps from me. Because Frodo rarely catches Mr Wubba Classic and it seems a little too heavy for him, he gives it 3 out of 5 Doh-Ah! I like the bright colour and the neoprene fabric seems more chewy so I'm inclined to fetch Wubba WET from sea more than the Classic. But because it does not squeak and seems a tad bit more fragile, I'm giving it 3 out of 5 Flaps. Because it does not squeak but he can catch it better, so he gives it 3 out of 5 Doh-Ah! So after much discussion with Frodo, we decided that our preferred choice in favour of the squeak is Mr Wubba Classic! Mr Wubba Classic wins by a teeny tiny margin over Mr Wubba WET. Come on mama! Fling the toy already! We wanna go fetch it! Stop dangling Mr Wubba as carrots! Woohoo! Old man me is still a sharp catcher! Even though Mr Wubba Classic squeaks but because Mr Wubba Wet is lighter and feels 'beefier' in my mouth, I favour retrieving it. Wubba! Wubba! We are two very happy toy testers! 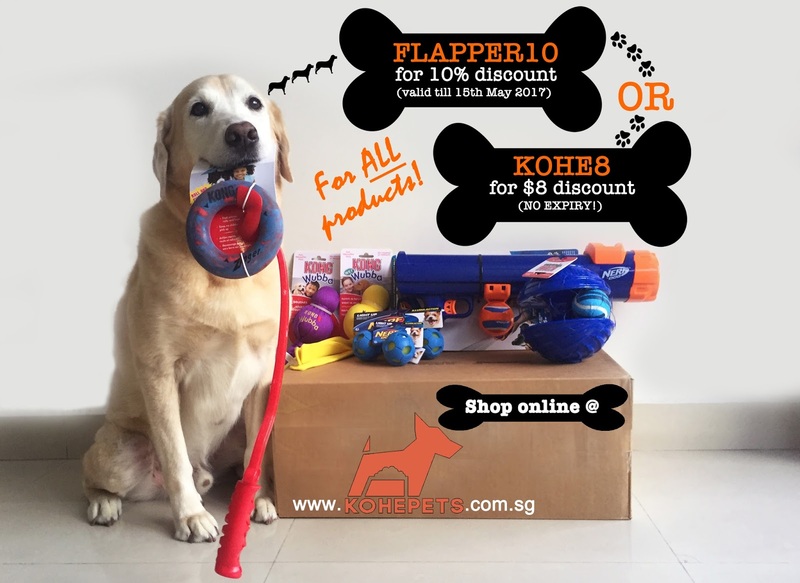 The promo with Kohepets is still ongoing! And I am finally done with my first toy review for Kohepets! Now... which toy should I review next? Love the beach photos!! Donna doesn't have a wubba, boo-hoo. :P I'm not liking the idea that the classic is still wet after 9 days though. I would choose wet just because of this. Haha. Actually, if WET squeaked, it would have easily won - weight, colour, dry-ability, tossibility, Frodo catch-ability... haha! The Classic feels thoroughly dry till I shook the toy while writing the review and "Alamak! How come still got water inside?". It does not seep out though so can still pretend it's dry. LOL.